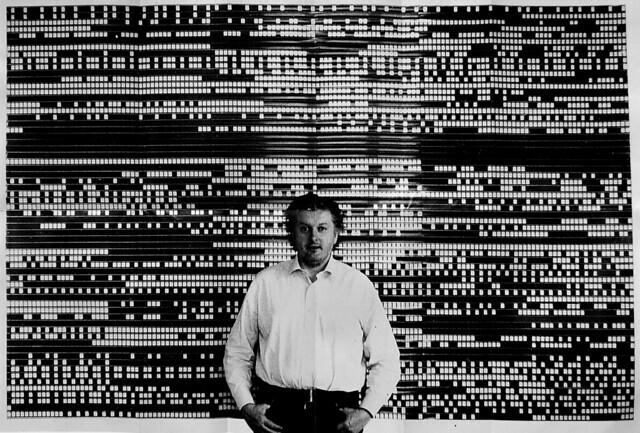 Peter Kubelka with a wall Iinstallation of Arnulf Rainer (1960). Arnulf Rainer is a famous 1960 film by Austrian experimental filmmaker Peter Kubelka. The film consists only from black and white frames, organized in a strict system. Kubelka also presented the film as a wall installation, with film frames arranged in a sequential order (see the photo above). Normally when we visualize a film or a video, we have to go through a process of reduction: scaling frames to a small size (for instance, the visualizations by William Huber shows 22,500 frames sampled from a 62.5 hr videoof Kingdom Hearts gameplay) or using geometric forms such as bars to represent some visual properties of the shots (for instance, see my visualization sketches showing patterns in shot length in two films by Dziga Vertov). A visualization of shot lengths in The Eleventh Year (Dziga Vertov, 1928). The length of a shot is represented by the size of a corresponding circle. Each row represents one film reel. However, since Arnulf Rainer only contains black or white frames, it becomes its own visualization as soon as we unfold these frames in a sequence, as can be seen in the photo of Kuleblka's installation.